India will soon be equipping its drones with precision-guided munitions (PGMs), according to the head of the country’s defense technology agency. According to The Hindu, on Monday Avinash Chander, the new Director-General of India’s Defense Research and Development Organization (DRDO) said that “in a couple of months” his organization would begin testing PGMs that are small enough to fit onto Unmanned Aerial Vehicles (UAVs). Speaking at the same conference as Chander, G. Satheesh Reddy, the head of Research Centre Imarat (RCI)—a missile research laboratory that is helping to develop India’s PGMs—said his company was working on extending the range of the PGMs to 100 km, up from 30 km currently. Since taking over DRDO in June, Chander has said that developing more advanced UAV technology will be a top priority for the defense technology agency under his management. India is already in the drone business, and demand for UAVs from the defense and civilian sectors is expected to increase drastically in the years ahead. Currently, annual UAV sales in India stand at about US$5.2 billion; this figure will increase to US$11.6 billion over the next decade, according to the Teal Group Corporation, a U.S. aerospace consultancy firm. A Teal Group executive told The Times of India last month that they expect India’s demand to be “50 medium-altitude, long-endurance (MALE) UAVs, 60 Navy UAVs, 70 Air Force tactical UAVs, 100 Army tactical UAVs and 980 mini-UAVs over the next decade." India’s precision-guided technology is currently far more underdeveloped, but Delhi is hoping to change this in the coming years through indigenous development or imports. 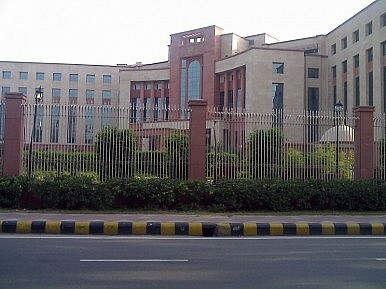 According to India Military Review, India’s precision attack and targeting capabilities are currently limited to laser-guided bomb (LGB) kits attached to dumb bombs.” The same source, however, forecasts that precision bombs and missiles will become much more common among Indian Naval and Air systems over the next five to ten years. Indian defense experts The Diplomat spoke with were therefore skeptical that India’s drones will be equipped with miniaturized smart bombs any time in the immediate future. Yogesh Joshi, an expert on India’s strategic and missile capabilities at the School of International Studies at Jawaharlal Nehru University in Delhi, was slightly more optimistic. Both experts also agreed that having such a capability would be useful to Delhi in a number of important areas. He didn’t believe that the drones would be used to target anti-India militants inside Pakistan proper in the same way that the U.S. has used its drone fleet to carry out targeted strikes against al-Qaeda and Taliban fighters operating in Pakistan’s northwestern regions. “I think it will be foolish to use them against militants on foreign soil,” Joshi said when asked by The Diplomat if the drones would be used inside Pakistan. He pointed out that Pakistan has repeatedly said it has the capability to shoot down U.S. drones, and Iran has in fact taken down a U.S. drone that was conducting surveillance operations in Iranian airspace. Satellite imagery analysis confirms that Chinese BZK-005 drones are operating in the East China Sea. OK Drone: Vietnam Enters the UAV MarketIran Downs U.S. Drone?What’s Behind Thailand’s New Drone Laws?Trump-Modi Meeting: India to Push for Predator Drone SaleWhat’s Behind China’s Big New Drone Deal?